Did you know that the sale of luxury homes in Tallahassee is booming? In fact, there are people around the country who believe that the priciest homes are actually carrying the current housing market recovery, and that appears to be true in Tallahassee as well. One way to evaluate the luxury home market in Tallahassee is to look at the slice of homes that are larger than 3,000 square feet to see how they are performing now, compared to recent years. 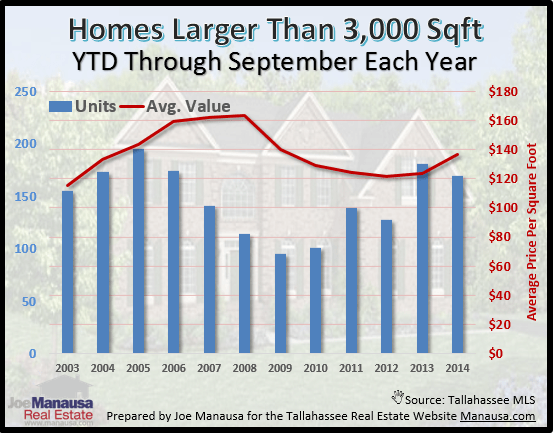 Through September, there have been 169 homes larger than 3,000 square feet that have sold and closed in the Tallahassee real estate market. While that is 7% below the 181 sales posted last year, it does represent an 80% improvement over the low point for luxury homes established in 2009. Last year saw a 43% increase in luxury home sales and this year's continuation shows that these larger homes are pulling their weight in the housing market recovery. In the real estate graph above, the blue columns show the number of homes (larger than 3,000 square feet) that have sold through September of each year, while the red line shows the average price of these sales. The average price of homes greater than 3,000 square feet are up 8% and are only down 17% since the peak of the luxury home market in 2008. 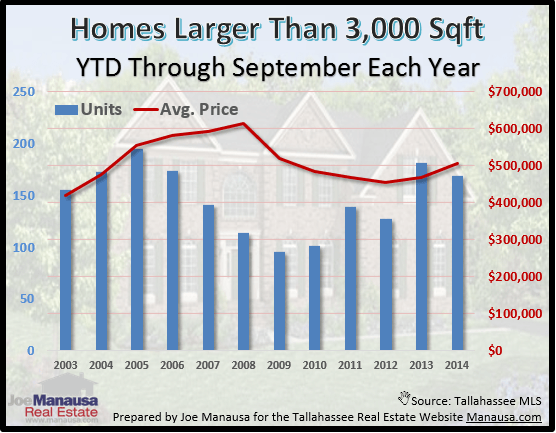 Considering that the average price for all homes sold in Tallahassee in 2014 is dead flat through September, one can see how the priciest homes are definitely a big part of the recovery. The average value of a home larger than 3,000 square feet in Tallahassee has appreciated 10% this year to $137 per square foot on average. Today's current values represent a 16% decline since the peak for valuations was reached back in 2008, the year that buyers were paying the most for homes larger than 3,000 square feet. While the entire real estate market will be impacted by rising interest rates in the very near future, no segment will be impacted more than will be the homes that comprise this upper end of the market. As we have demonstrated in past reports, luxury home sales skyrocketed with the combination of new loan products and sub 7% interest rates. While many of the loan products have gone the way of the dinosaur, current rates are still well below 5% and continue to make larger homes affordable. Look to see plenty of good buying opportunities in this heavily overbuilt segment of the Tallahassee real estate market. If you are a cash buyer, expect to see epic opportunities when rates return to and above their 50-year average (roughly 8.5%). I believe this will cause the buyer-pool to shrink to less than 20% of its current size, while the supply side will only be shrinking due to falling prices. If you are a buyer who is financing, you will want to do a cost-benefit analysis of buying now versus waiting. Due to incredibly low mortgage interest rates, all long-term luxury home buyers who are financing their purchase will want to make a move now so as to lock in current rates. Whether paying cash or financing, buying or selling, we can help you make the best decision possible in the luxury homes market. For a personal consultation, simply drop me a note and we'll schedule a time to review your needs, wants, and best courses of action. The following list is the ten most expensive homes for sale in Tallahassee, and a simple click will take you to all the rest of the available listings in Tallahassee.